www.sportseventsmagazine.com 2019 Baseball/Softball Sourcebook 9 Baseball Spotlight: But even as the stadium is being built, the CVB has already booked the Big South baseball tournament with the intention of going after the Atlantic Coast Conference, and other NCAA and amateur events, Meroski said. "The field configuration will provide a great venue for multi-events," he said. As far as the increase in youth baseball tournaments and events, Meroski credits CVB sales manager Stephanie Decatur, who works with local and regional planners, and each of the area's Parks & Recreation departments to recruit more tournaments. Decatur also attends several national trade shows each year and holds sales blitzes in key areas of the region to secure more business. The work has paid off. The Fay- etteville CVB saw an average of 1,440 visitors per weekend during 21 weeks of baseball tournaments this year. The estimated economic impact is $57,000 per week- end or $1.2 million total, Meroski said. There could be more of an upswing to come, if interest in the Little League World Series is any indication. Television ratings, in fact, hit a three-year high in 2018 as 3.25 million viewers tuned into ABC to watch the Honolulu team defeat a team from Seoul, South Korea, in the Little League championship game. Played annually since 1947, the Little League Baseball World Series is one of the marquee events in the multi-billion- dollar industry of youth sports. The entire tour- nament, not just the title game, was televised as viewers tuned in to watch their local teams compete on an international platform. 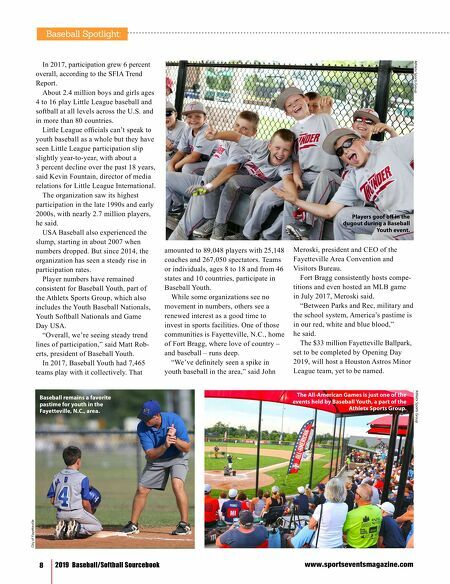 Another initia- tive launched by USA Baseball and Major League Baseball in 2014 aimed at getting more kids involved in baseball in all forms, no matter who they are or where they live. Through Play Ball, kids get a chance to meet MLB players during the waning days of the season at special events held on Major League fields. The initiative builds on the idea of baseball as a community, with its youth brands, Minor League and Major League teams. This year, more than 300 mayors threw their support behind the effort. The idea is simple: If children play baseball, they are more likely to be lifelong fans. But it's also about getting kids on the field with practices, drills and coaching events offered for free. n new next tournament, play somewhere From budding talent to established superstars, OKC offers new experiences at every turn. 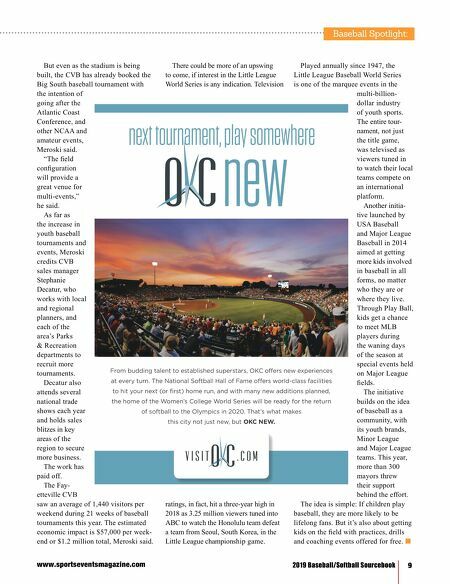 The National Softball Hall of Fame offers world-class facilities to hit your next (or first) home run, and with many new additions planned, the home of the Women's College World Series will be ready for the return of softball to the Olympics in 2020. That's what makes this city not just new, but OKC NEW.